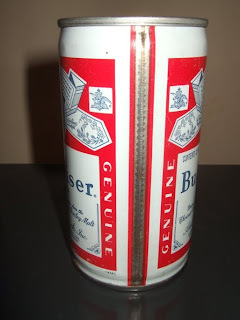 It's been awhile since we've posted, so just for the heck of it...today we look at a welded beer can seam on a classic Budweiser can. Various types of seams can be found on older steel beer cans; soldered cans with notches, straight soldered seams with no notches, and soldered seams with 'crimps', like in today's example. This is probably one of the most recognizable beer cans on the planet!